Its truly amazing. Paper you can print on and stick to your fridge cooker or any other metallic household item. Should work on fridges, freezers, washing machines, tumble driers, microwaves and more. It makes great projects for children too. The material is easily cut with ordinary household scissors; so stick any sticker on and cut round to make pretty fridge magnets like the George Pig sticker on our blue cooker. Design any document on any computer software and just print (make sure you select te correct paper size). Or print your special photos on magnetic paper and stick them on the fridge. Or if you have a pre-printed photo simply apply ordinary paper glue to the rear of the photo and stick it on the magnetic paper. The material will adhere to any surface that contains magnetic metals usually iron or steel (but also Nickel and Cobalt). So they will stick to most household appliances that have a steel surface. For the office the sheets are great for labelling filing cabinets; if you often forget what's in each draw print the list and stick it to the front. Great for metal storage racks and cabinets too. Much easier than sticking conventional pieces of paper! 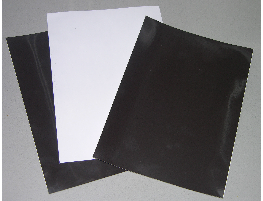 The paper can be used with most inkjet printers. Check you printer can take 0.85mm thickness. We recommended that you feed these sheets through the printer one at a time. They tend to work best with printers with straight or simple paths. And if you don't want to print it you can use practically anything you can do on paper. For example, paint, crayon, colour, felt tip, stick (use any paper glue), draw, pencil, charcoal. This is a good way to keep children quiet for the odd hour or two and a boon for half terms and long school holidays. We sell packs of 4 sheets of A5 paper on eBay. A5 sheets are better value as they are easier to handle (about 148 x 209mm or 8.25" x 5.75") and an ideal size for printing photos on a home inkjet printer.